He has just finished the red grouse image, and this is shown above. I am used to seeing Colin’s ‘miracles’ in progress on a daily basis, but even I am completely blown away by this. 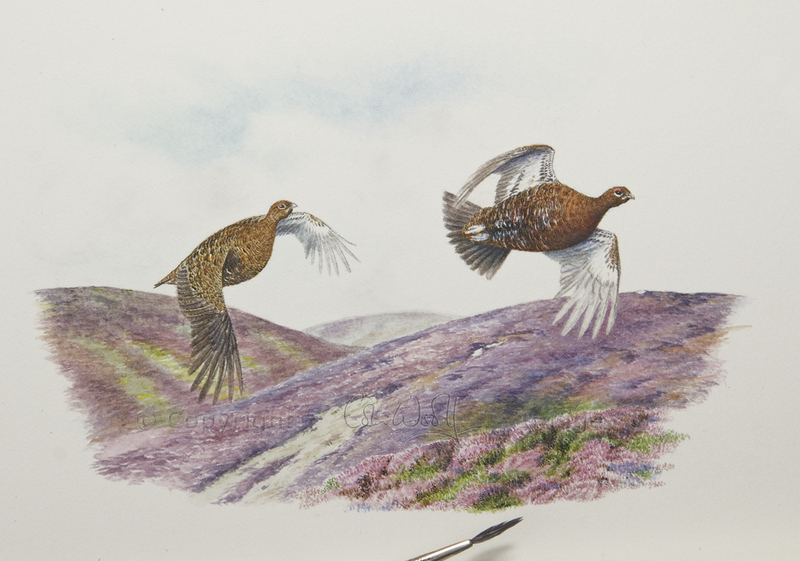 The richness and subtleties of colour in the background, the perspective, the detail in the heather, not to mention the grouse themselves, have all been created using one tiny, infuriating little grouse pin-feather which you can see in the bottom of the picture. I don’t think anyone has even attempted this before, let alone succeeded to this degree. Coming up next: black grouse. Stay tuned! Wow, Jo, I’m speechless! I know that I’m going to be repeating myself over and over with my reactions to Colin’s paintings, saying I can’t believe it, how does he do it, etc. but I honestly am astonished every time. This is beautiful and I love the way he’s done the sky, so subtle and yet exactly what it’s like sometimes with a hint of blue behind the clouds. The colours are beautiful and the details are wonderful. How he does this with a feather I really cannot fathom. I know, Lorna, it is pretty amazing. I don’t know how he gets such a smooth wash, particularly with such a fiddly little feather. I would be very pleased to have done that with just an ordinary brush. Anyway, he’s on a roll and making progress on the black grouse now! Thank you very much for your comment, which Colin appreciates too. Great painting! Mr. Colin is a pro. No doubt. Thank you! I have to agree with you there! Always so amazing to see. Thank you! The finished picture (with all five birds) will be incredible. Wow, beautiful artwork! He is quite talented! Thank you! It has worked very well, better even than Colin hoped.